Hush! Can't you see they're kissing? The Dark Knight and the Feline Fatale steal a kiss! Limited edition statue features Batman and Catwoman. From the pages of the Batman: Hush graphic novel. 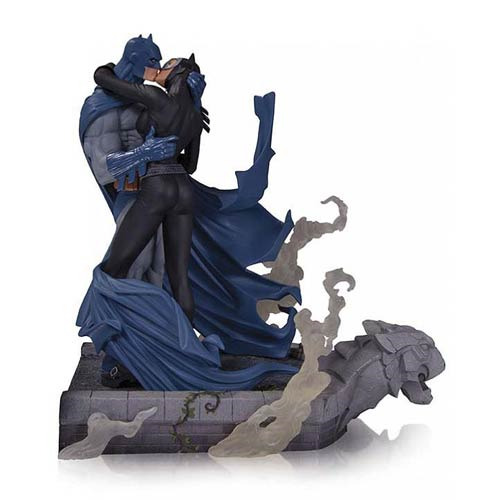 The Dark Knight and the Feline Fatale steal a kiss in this intricately sculpted sculpture ripped from the pages of the bestselling Batman: Hush graphic novel, illustrated by superstar artist Jim Lee. This touching yet dramatic Batman and Catwoman Kiss Statue is a limited edition of 2,500 resin pieces that stands approximately 11-inches tall on a remarkable display base. Steal one for yourself! Ages 14 and up.